As early as September 1964, the need for a sewer system in the Yucaipa Valley was the subject of meetings and discussions by the County of San Bernardino, County of Riverside and civic organizations in the area. In March 1966, the State Department of Health released a list of 200 communities in California that were in need of sewer systems. The Yucaipa Valley appeared on this list two years prior to this date. In June 1966, the San Bernardino County Department of Environmental Sanitation revealed that the Yucaipa area was second on the county's list of communities in greatest need for sewers. Early in 1970, a committee comprised of representatives of several local water companies organized to investigate the formation of a County Water District in the Yucaipa Valley to address issues related to the lack of water supplies and poor water quality caused primarily by septic systems in the area. The Yucaipa Valley Water District was formed on September 14, 1971 as the primary agency responsible for water and sewer service for the region. In 1972, the District initiated planning of a public sewer system to eliminate the water quality impacts associated with nearly 10,000 privately-owned septic tanks and leaching pits as required by the Regional Water Quality Control Board. On March 9, 1973, the Santa Ana Regional Water Quality Control Board issued orders requiring the installation of a sewer system in the Yucaipa Valley with daily fines to be levied on all septic tanks in operation after July 1, 1977. This order also implemented a development moratorium in the Yucaipa Valley. The County of San Bernardino also indicated it would order a similar mandate, and the Federal Pure Water Act also carried provisions that if the state did not enforce the law, the federal government would do so. The reduction in available groundwater supplies and the deterioration of the groundwater quality was ultimately solved with the construction of over 100 miles of sewer collection pipelines and a new sewer treatment plant which was completed in 1986. 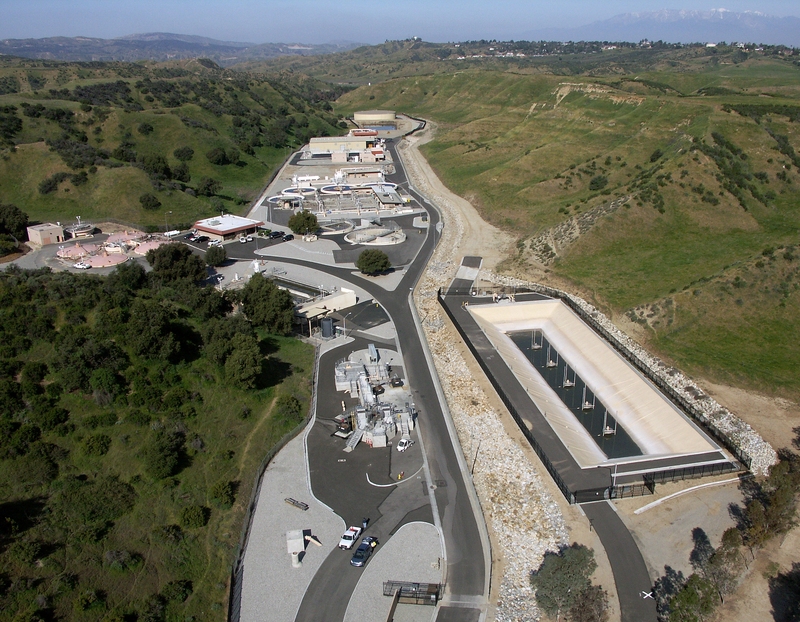 The 3.0 million gallon per day sewer treatment plant consisted of screening/grit removal, primary sedimentation, trickling filters, aeration tanks, final sedimentation, chlorination, and an effluent land outfall to san Timoteo creek. Solids handing consisted of anaerobic digestion, dissolved air flotation and sludge drying beds. In just a few short years, the regulatory requirements to add tertiary filtration required the upgrade of the original treatment plant to be expanded. 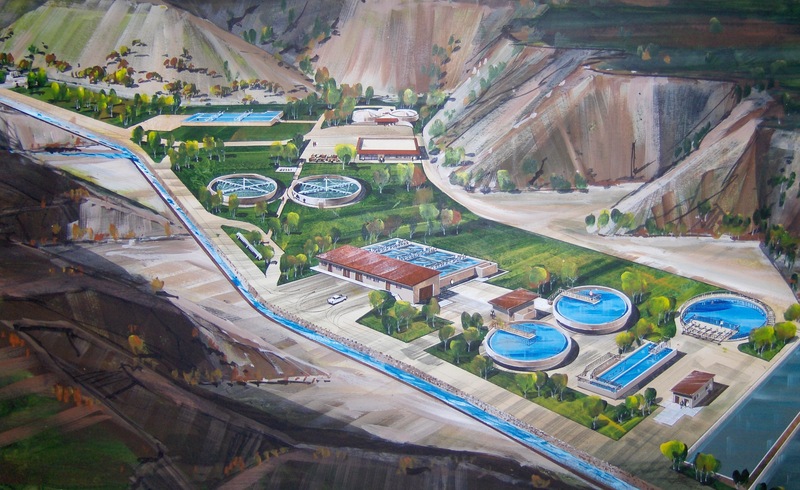 In 1994, the sewer treatment plant was upgraded and expanded to include an overall upgrade to 4.5 million gallons per day, plus denitrification facilities to meet the nitrogen limits in San Timoteo Creek, new tertiary filtration systems (flow equalization, rapid mixing, flocculation, gravity filtration, and various chemical additions), chlorination, dechlorinization and a recycled water pond. These facilities were designed and constructed to meet the nitrogen standards for a live stream discharge to maintain the beneficial uses of San Timoteo Creek. On January 22, 2004, the Regional Water Quality Control Board adopted Resolution No. R8-2004-001 which established more stringent discharge limits for total dissolved solids and nitrogen. This resolution is commonly referred to as the 2004 Basin Plan update for the Santa Ana Watershed. For the most part, the limits set for total dissolved solids and nitrogen were based on historical concentrations recorded from 1954 to 1973. This time period brackets the date of 1968 when the State Water Resources Control Board adopted Resolution No. 68-16, "Statement of Policy with Respect to Maintaining High Quality of Waters in California". As part of the 2004 Basin Plan update, the Yucaipa Valley Water District, the San Timoteo Watershed Management Authority and the Chino Basin Watermaster proposed that alternative, less stringent water quality objectives be adopted for our groundwater management zones. The District's proposal was based on Water Code Section 13241 and the requirements of the State's antidegradation policy (State Board Resolution No. 68-16). Since the less stringent objectives would allow a lowering of water quality, the District was required to demonstrate that the proposed objectives would protect beneficial uses, and that water quality was consistent with maximum benefit to the people of the state would be maintained. The District achieved this demonstration and still operates under extremely stringent discharge requirements. Today, the Henry N. Wochholz Regional Water Recycling Facility ("WRWRF") provides exceptional treatment capability that is superior to most other sewer treatment plants. The WRWRF consists of primary, advanced biological secondary and tertiary treatment with advanced total nitrogen removal. While certain processes within the sewer treatment plant have higher capacity ratings, the current overall capacity of the sewer treatment plant is 6.67 mgd. The advanced tertiary filtration process consists of a combination microfiltration to remove particles larger than 0.1 micrometer followed by ultraviolet disinfection. This advanced tertiary treatment easily meets the Coliform bacteria removal and turbidity requirements of Title 22 for reclaimed water. The District is implementing the necessary facilities to maximize the use of this high quality recycled water in our service area. The adage that engineers design treatment plants but operators make them work is never more true than at the Henry N. Wochholz Regional Water Recycling Facility. The staff members operate this facility to meet stringent discharge requirements and water recycling objectives. The staff members of the Yucaipa Valley Water District were highlighted in the January 2011 edition of Treatment Plant Operator magazine. This article discussed how the District staff: manages influent flows with equalization tanks; controls algae growth on secondary clarifier weirs; deals with Nocardia filaments and resultant foaming; and reduces ammonia recycle to the biological treatment system. When a sewer overflows, it is usually the result of inappropriate materials in the sewer system. Please help us protect our community and prevent sewer backups and overflows! Have you ever experienced a sanitary sewer back-up or overflow? Luckily, most sewer back-ups and overflows can be prevented with a progressive preventive maintenance program. All of us can help to prevent them by wisely using the Yucaipa Valley Water District's sanitary sewer system. The District is "recruiting" customer partners who are willing to join our efforts to prevent sewer back-ups and overflows. Sewer back-ups and overflows are frequently caused by improper materials such as fats, oils and grease being placed into the sewer system by the District's customers. Since fats, oils and grease are lighter than water, they tend to accumulate at the top and sides of sewer pipes and can build up until a blockage occurs. If a blockage happens, the sewer backs up or overflows resulting in property and environmental damage. The Yucaipa Valley Water District's Sewer Use Ordinance requires that restaurants should install and maintain grease traps and/or interceptors to prevent grease from entering the sewer system. However, there are many more residential kitchens than there are restaurants in Yucaipa and Calimesa. By reducing the amount of fats, oils and grease that enter the sewer system from homes, you can help to protect the environment by preventing sewer back-ups and overflows. Sanitary sewer systems are designed to handle three things: used water, human body waste, and toilet paper. You can do some simple things that will help the District protect water quality and maintain the sewer system in our community. Collect grease in a container and dispose of it in the garbage. Place food scraps in waste containers or garbage bags for disposal with solid waste, or start a compost pile. Place a wastebasket in the bathroom to dispose of solid waste; such as disposable diapers, personal hygiene wipes and personal hygiene products. These suggestions can save you money too! Most sewer back-ups occur between the house and the sewer main, where the property owner is responsible for correcting the problem. Avoiding blockages means avoiding plumbing bills. When the blockage occurs in the District's sewer main, the District will correct the problem. Please contact us at (909) 797-5117 twenty-four hours a day, to report a sewer back-up or overflow.